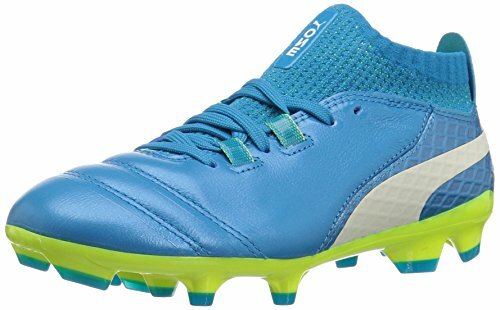 Give your little superstars the confidence they need to play their best with the Puma® Kids ONE 17.1 FG soccer cleat! Super thin and soft premium leather upper provides the ultimate touch and feel on the ball. evoKNIT sock for maximum comfort and a snug fit around the ankle. Lightweight TPU outsole with a mix of bladed and conical studs. Suitable for use on firm ground. Imported. Measurements: Weight: 7 oz Product measurements were taken using size 2 Little Kid, width M. Please note that measurements may vary by size. Give your little superstars the confidence they need to play their best with the Puma® Kids ONE 17.1 FG soccer cleat! Super thin and soft premium leather upper provides the ultimate touch and feel on the ball. evoKNIT sock for maximum comfort and a snug fit around the ankle. Lightweight TPU outsole with a mix of bladed and conical studs. Suitable for use on firm ground. Imported. Measurements: Weight: 7 oz Product measurements were taken using size 2 Little Kid, width M. Please note that measurements may vary by size.